Mother Goose Rhymes. Rhymes + The Very Best Books To Share With Your Child. Think nursery rhymes and you're probably thinking of Mother Goose rhymes. That's no surprise because Mother Goose rhymes have been a part of childhood for kids in English-speaking countries for more than 200 years. They're still great fun to share with babies and pre-schoolers but did you know that reading nursery rhymes to children also plays a really important part in laying the foundations for learning to read? The evidence on this is now very clear. In a nutshell, hearing nursery rhymes and poems - complete with the actions and silly words - is crucial in helping young children develop something called phonological awareness. I found this all quite fascinating when I first learned about it. I still do. I'd never heard of phonological awareness before and I certainly didn't know that reading nursery rhymes and playing rhyming games built the connections in the brain that help children learn to read. I'm a primary school teacher now and I find that many teachers don't know about this. They know about phonemic awareness and phonics but are not aware of the importance of phonological awareness. Yet there is now strong evidence to show that children who have little or no exposure to nursery rhymes struggle to read and learn at school. On the other hand, children who are exposed to nursery rhymes are likely to learn to read naturally and easily and to become capable readers and students. So, if you'd like to get started with sharing some nursery rhymes with your little one, have a look at the books of Mother Goose rhymes below. (Note: book titles and covers are affiliate links). 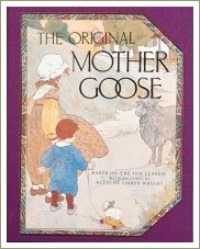 Over the years there have been literally hundreds of books of Mother Goose rhymes published, each one including its own selection of rhymes. A well-chosen book of Mother Goose rhymes is a fantastic addition to a new baby's personal library but how do you choose? There are lots of versions to choose from so I've written brief reviews of my three favourites to help you choose. Each illustrator has used a different approach to illustrating the rhymes so each book has a different feel to it. Some of the illustrations are more modern, some are traditional. I think all of them are gorgeous. The one you choose is simply a matter of personal preference. 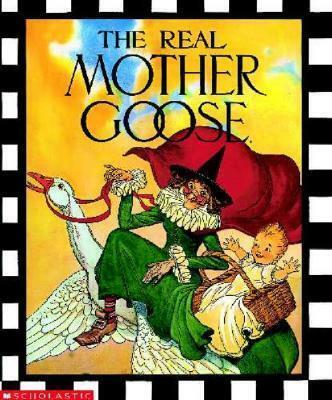 This is a comprehensive book containing more than 250 mother goose rhymes. The well-known nursery rhymes are all there, as well as many less familiar Mother Goose rhymes, all beautifully illustrated by Blanche Fisher Wright. The artwork in this book is traditional and very charming so it would make a beautiful gift for a new baby, for a baby shower or for a first or second birthday. It would also be a lovely thing to buy for your own child if you're expecting a baby or have a new little person in your family. 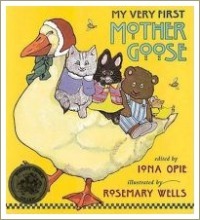 Iona Opie is the acknowledged authority on all things Mother Goose and this hard-cover book, edited by Opie, is really lovely. 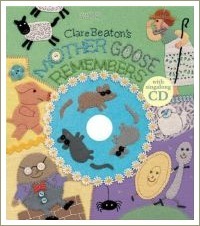 It contains over 60 of the best Mother Goose rhymes organised into four chapters of large, toddler-friendly type. The gorgeous water-colour illustrations and larger format of this 108-page book make it especially good for babies. This book too would make a great gift for a newborn or a wonderful first-birthday present. This hardcover book is a delight. 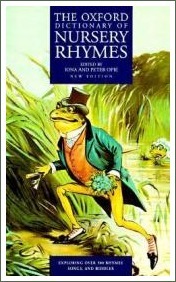 It contains over 300 rhymes, including all the traditional rhymes plus a few of the rarer ones too. The illustrations and format are traditional, in keeping with the original rhymes. The rhymes haven't been translated into modern English so you may have to explain some of the old English words. 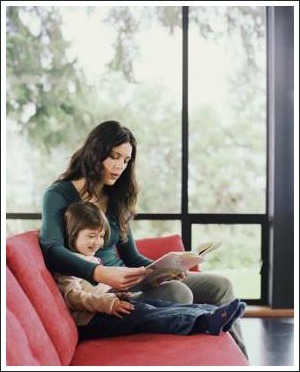 What a great opportunity to extend your child's vocabulary! This is a well-chosen collection of traditional rhymes, poems and songs. It's a hardcover book, with 64 pages and a total of 46 rhymes and songs, plus a bonus sing-along CD. All the old favourites are included and the illustrations are gorgeous - photos of hand-sewn designs, using antique fabrics, felt, beads, braids, lace, buttons, and bric-a-brac. This is a great, inexpensive choice for a young child. Opie, I; & Opie, P. (1997). The Oxford Dictionary of Nursery Rhymes. Oxford: Oxford University Press. Bryant, P.E; Bradley, L; Maclean, M; Crossland, J. (1989). Nursery Rhymes, Phonological Skills and Reading. Journal of Child Language, 16(2), 407-428. "There is a strong relation between early knowledge of nursery rhymes and success in reading and spelling over the next three years even after differences in social background, I.Q and the children's phonological skills at the start of the project are taken into account. This raises the question of how nursery rhymes have such an effect. Our answer is that knowledge of nursery rhymes enhances children's phonological sensitivity which in turn helps them to learn to read." (Bryant, Bradley, Maclean & Crossland, 1989).